With warmer weather almost within an arm’s reach (it’s finally March, hooray! ), we’re setting our sights on all things spring. We’ve been talking about our favorite wedding favors for the season and we have a new one to add to the list: tree wedding favors! These evergreen seedling favors from Beau-Coup are easy to plant, so guests can add new trees to the earth in honor of your special day. Instead of a wedding favor they may never use (or worse, throw away), these trees get put back into the soil and become beautiful evergreen trees. Take a look! For a truly green wedding, there’s nothing better than these personalized evergreen tree wedding favors. It’s a real tree seedling, individually wrapped in burlap bags, and finished with a complimentary personalized tag. This favor is ideal for your outdoors, woodland, or rustic themed event. 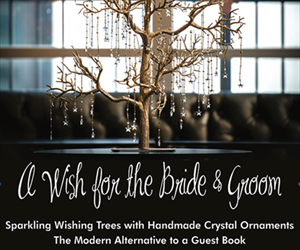 Buy your tree wedding favors here! Ready to get yours? You can buy your evergreen seedling favors from Beau-coup. Giveaway: Win a Zodiac Necklace!